The Peterborough & District senior men’s team go into the Christmas break within touching distance of the top of the Cambs League following their latest victory – 8-2 away to Cambridge Chesterton B. The defending champions are third just four points behind leaders March A with a match in hand, and one point adrift of second-placed St Neots A.
Mick Fuller, Steve Johnson, Norman Gray, Ean Eagle won 25-10. Joe Martin, Richard Day, Mick Greaves, Rod Maplethorpe won 25-11. Les Sharp, John Barker, Terry English, Mick Linnell won 20-13. Don Paul, Jeff Clipston, Graham Jackson, Ray Keating lost 14-16. 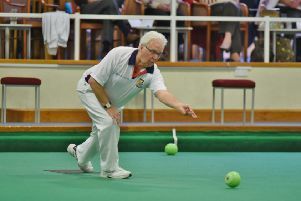 Several local bowlers have been selected for England indoor senior and junior international teams following the recent trials weekend at Rugby. Nicky Brett once again skips an England rink for the international series in Scotland next March, with daughter Chloe chosen for an under 25 British Lions team competing in Nottingham on February 10/11. The strong Spalding club are well represented with Graham Smith and Matt Whyers both selected for the England senior team, with Jordan Philpott named in the junior team for the international series in Ireland on February 17/18. Ruby Hill and Chelsea Tomlin have been chosen for both the senior and junior women’s team, with Annalisa Dunham joining them in the senior team.